I’ve lived for almost five years with one of Daegu’s best pork kimchi jjim restaurants less than 10 seconds walk from my front door. I very quickly developed a taste for this tasty dish and over the years have managed to gleam a few tips to help me reproduce it. This recipe is best with sour, aged kimchi, indeed the older the better. Even kimchi of a year old and which has started to grow a layer of mold on the top, can be washed clean and used for this truly satisfying and healthy meal. The best cut of meat for this is pork leg and if you have time to cook on a low heat for an hour or more, you can cut the meat in large chunks about 1.5-2 inches square. My local restaurant cooks the pork, in large chunks, for several hours until it melts in your mouth. For quicker versions you can reduce the cooking time by cutting meat into smaller portions. If this is the case avoid more fatty cuts of meat – such as pork leg. 240 grams pork tenderloin (목살) or front leg (앞다리). If you have time, leg is preferable. Mooli – about same amount as onion, diced, but omit if this is a main component in your kimchi. White turnip is a good substitute. See also suggested accompaniments at the bottom of the page. Ideally as an earthenware pot or ‘ttukbeki’ (뚝배기) or a heavy bottomed sauce pan. Put the pork in the marinade and leave from two hours or overnight. Then add the marinade and bring back to the boil, boiling for five minutes before reducing the heat to a simmer for 25 minutes. You will need to add around 1 cup of extra water during simmering. If my meat is cut larger than inch cubes, and if I’m using the more fatty leg meat, I will cook on a low heat for up to an hour – until the meat is at a stage where easily falls apart. Stir occasionally and add extra water to maintain the original level. Before serving and an extra teaspoon of sesame oil, some sesame seeds and/or pine nuts. 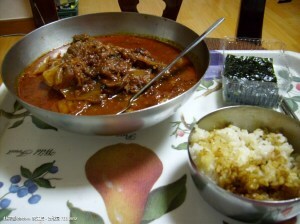 Serve with an accompanying bowl of rice and a selection of side dishes (반찬) and laver bread (김). ©努江虎 – 노강호 2012 Creative Commons Licence.